Let's take a moment to admire the print on this cup! Isn't the pattern on the cup so visually appealing? I'm a sucker for cute looking food tehee. 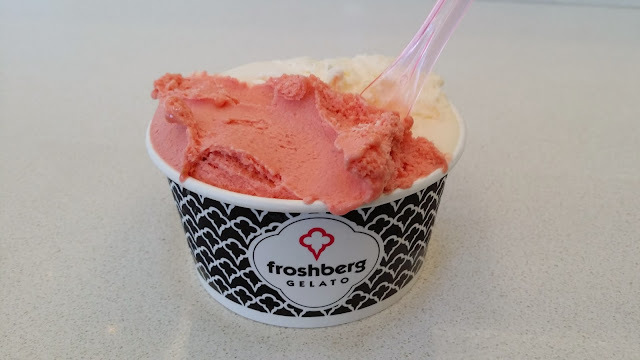 All aesthetically pleasing details aside, after trying a variety of flavours, I opted for the Strawberry with a half serving of peach/mango in the second smallest size. The portion size looked tiny but I couldn't finish it. The texture of the gelato was soft and creamy. The strawberry flavour tasted distinctly like real strawberries. The peach/mango tasted predominately of peach. The gelato was sweet but not overly sweet. The verdict: Not the best gelato I've ever had, but up there on my list! Overall insanely yummy, and a refreshing afternoon treat (even though it was cold outside) haha. I'll definitely be frequently this place in the summer!